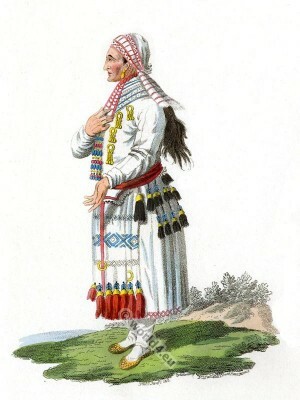 Mordοvia Woman in traditional dress. Home » Mordοvia Woman in traditional dress. Mordοvia Woman in traditional dress of the Moksha Tribe. Une Mordvine, de la Tribu Mokchanienne. THE head-dress of the females of the Mokchanien tribe is less costly than that of the Erzianian, and has no other ornament than a little embroidery. Two narrow fillets are fastened to it, which descend the bosom, are ornamented with small silver coins, and terminate in little chains of the same metal. To the clasp which fastens the tunic round the bosom is added a large escutcheon, or breast-piece, to which are appended several rows of coral. Glass beads of various colours serve them for necklaces: the apron is formed of four fillets or bands, which are united by small clasps, trimmed with tassels, and loaded with coral. The females advanced in years wrap linen round the head instead of a cap, and the hair either hangs loose down the back, or is fastened in tresses. This entry was posted in 1803, 19th Century, Asia, Russia and tagged Edward Harding, Russian national costumes on 11/5/14 by world4.